Everyone with any knowledge of the Dark Gods knows there are four that have risen to ascendancy within the Realm of Chaos; Khorne, Nurgle, Slaneesh and Tzeench. These are the four most powerful Gods, balanced against each other by constant infighting, alliances and betrayals that ensure no one can ever be more powerful than the others. Yet this was not always so. Prior to the Fall, the god Slaneesh was little more than a wayward element within the Warp; a Lesser God whose power could never hope to match his rivals. There are, in fact, countless "gods" within the Warp. These can range in power from creatures such as Slaneesh, who are on the verge of challenging the Dark Prince's position within the Great Powers, to creatures with power comparable to a Greater Daemon, or Daemon Prince. But why follow this path? Is it not enough to allign yourself to "Undivided" if you do not wish to place your faith in one of the Great Four? Well, perhaps from a gaming perspective, but adding a new God to the pantheon is a unique and interesting way to spice up your forces. After all, you probably encounter all manner of armies that worship "Chaos Undivided", but only your Warband is dedicated to the Warp-God Ulvigtzatl! It is worth remembering that your Warband is distinct from your chosen God; the degree of influence your deity has is up to you. Also, the power of the God does not have to reflect your army. For example, a strong God can easily have several Warbands under him, whilst a mighty Company of Traitor-Marines might be led by a single individual who follows a smaller god. Finally, remember that Gods are fickle things; if you worship Chaos Undivided, that means you worship Chaos as a whole - and that includes the little guys! So, why not try mixing and matching? Instead of Death Guard, include in your army a squad dedicated to the God of Pain, who has granted them unholy resilience. An infiltrating Chosen unit would be an ideal candidate for servants of the Ashtva, the Master of Shadows. Finally, why not bring forth a Greater Daemon - what better way to display the power of your little-known god than one of his messengers beating the living hell out of everyone? Below are but a few ideas for "Lesser Gods" that may bless your warriors in their quest for glory. D'rath personifies mankind's desire for all things. He embodies the kleptomaniac lusting that consumes all men, the avatar of the insatiable need for more. D'rath's realm is a floating castle within the Warp. Inside it, trinkets rise up from the floor, stacked high from across time and space. Upon his walls hang all manner of decorations, from priceless artworks to child's scrawlings, from opulent banners to flayed corpses. His towering mounds of wealth contain all manner of lustful items; money, weapons, gemstones, pieces of art, books of ancient lore and almost anything a man may conceivably long for. All of these things lie neglected, for D'rath and his followers lose interest the moment their prize is acquired; he is forever longing, forever lusting, ever searching for some material object that will somehow grant his existence ultimate purpose. Men are not drawn to worship D'rath as such, rather they are slowly turned toward him due to their own internal thirst. D'rath does not offer salvation to his followers and their material lustings, he embodies it. Their souls become bound to him, doomed to spend the rest of their mortal and immortal lives hunting, taking, stealing and killing to obtain the unobtainable; contentment. All men have within them a desire to turn on their fellow men. Whenever someone lies, cheats or steals at the final moments to deny those who aided them, they are giving a blessing to the Master of Betrayal. Nulcrali is not the God of Traitors. Rather, he is the emobidment of those who turn on their allies through carelessness and flippantry; a passing lust for success that ultimately hinders more than helps. Due to the paradoxical nature of Nulcrali, his followers are difficult to find. Invariably, they will turn upon each other, often at such a critical juncture than it assures their own destruction as well as those they backstab. He is depicted as an eight-headed serpent, forever attacking himself. His daemons are equally reptilian, and equally unhelpful. Of all the gods, Nulcrali is often considered a lesser aspect of Slaneesh; the Dark Prince has been known to take perverse pleasure in betrayal and insurrection, revelling in the emotional anguish, and bloody aftermath of such deeds. Ashtva is one of the oldest Chaos Gods in the universe. He was born when cavemen first peered out into the night, and saw the glinting eyes of hunting beasts. From that day, Ashtva has feed upon the fear of men. Known as The Deathly Shadow, Ashtva is the fear of the dark. He is the thing that goes bump in the night, he is the monster under the bed. Ashtva embodies the irrational fear of shadows and dark places. His followers typically exploit this fear in their tactics, favouring covert assaults and ambushes rather than open warfare. Daemons in service of Ashtva are sinister things; indistinct shapes of fur and teeth and talon. They wrap the darkness around themselves, and thus their true form is never seen. They lurk within his realm, itself a place of infinite darkness, prowling his Night Forest, where the very shadows themselves sprout from the soil like trees. Anyone who enters this place will be stalked by the Critters; tens of thousands of tiny beasts that wait for their victims to close their eyes. To even so much as blink is enough - their prey will be consumed in a heartbeat. Ashtva is strongly opposed to Khorne; he despises the Blood God's loud, brutish way. He is also disdainful of Slaneesh, whose lustful ways are utterly alien to his quiet, patient malevolence. There is a God of Biggotry within the Warp; a personification of the irrational refusal to listen, stubborn defiance of fact and reason. That is Ivaltn. Ivaltn is the manifest refusal to admit fault or failing; he himself believes he is the greatest of all the Chaos Gods, and stubbonly fails to acknowledge any evidence to the contrary, be it spoken word or a legion of Khornate Daemons ravaging his Realm. There are few followers of Ivaltn, and this is perhaps just as well; their mind-numbing refusal to face reality can tax even Tzeench's patience. Ivaltn is opposed to anyone and everyone who does not see the world his way - which means, as he refuses to accept anyone's outlook, that he is utterly alone in the Warp. Top Left: A Follower of D'rath. 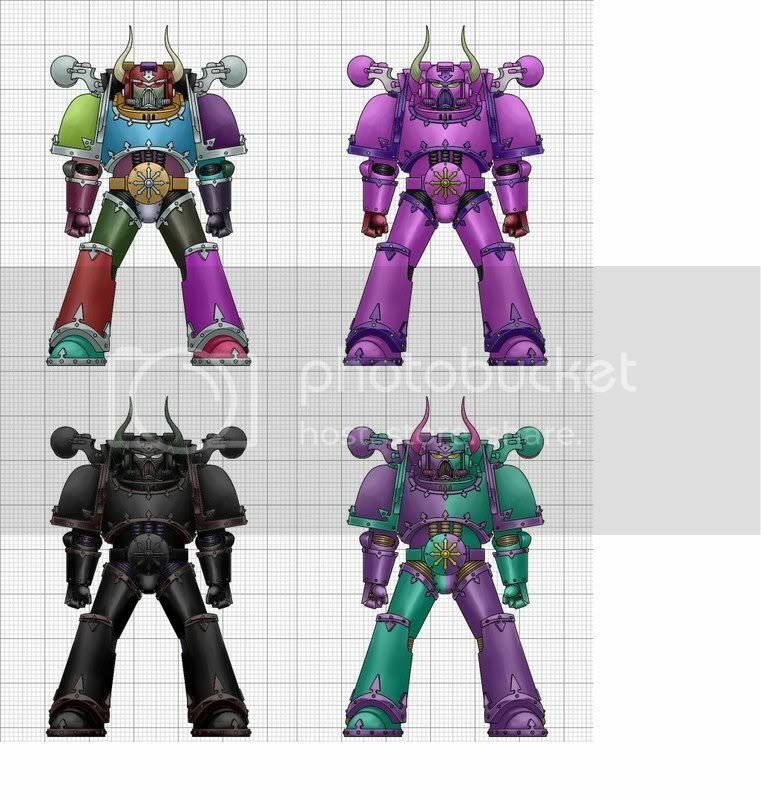 Driven to pursue all things, D'rathian warriors, like his Daemons, bedeck themselves in multicoloured armour, never able to choose a pattern or style that is satisfactory. The depicted warrior was part of a three-hundred strong warband that stole half a dozen Land Raiders from Abaddon's warfleet prior to the launch of the Black Crusade. Top Right: Tu'zanno the Skullbreaker: self-proclaimed Prophet of Nulcrali. A cunning and deadly warrior, his hands are forever stained with the blood of allies he has flippantly disposed of on his long and bloody campaigns. Last sighted leading a Corsair band into the Ork Empire of Gulcrakk Deffkilla. Bottom Left: A Deathwalker of Ashtva. Servants of the Shadow-God Typically wear all-black armour, so only their unholy eyes can be seen. The dark reds, blues and greens denote the warrior as a member of the Gallowmen, a Warband believed responsible for the disappearance of the Tau Custodian-class Starship Vior'la Kaius J'kaara, and have brought an entire Sub-sector to its knees; a region known as "Beyond" from which no living soul ever emerges. Bottom Right: Colours of the Waking Ones. Led by Riktus the Undefeated, the Warband once lost a vessel to a tendril of Hive Fleet Kraken, and have since convinced themselves the Tyranids do not exist - rendering this "defeat" null and void. They are on an insane campaign to destroy the entire Tyranid race, along with anyone who has ever encountered them, and purge all trace of the race from history.